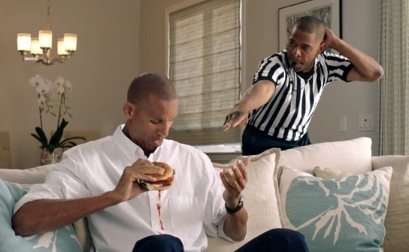 Amazon Echo has released a series of new commercials, starring Reggie Miller, celebrating its status of official partner of the NCAA. career with the Indiana Pacers does a lot of things with Amazon Echo, from coming clean, to turning up, showing some hustle, and looking alive out there. The 15-second spot titled “Reggie comes clean thanks to Amazon Echo” features Miller on the couch, staining his shirt while eating a burger. “Got excessive ketchup? Resulting a possible stain”, says a referee showing up behind Miller. The referee has something to add – a piece of advice on how to clean the shirt: “two washes, wring it, hang it outside”. The spot ends with Amazon Echo’s logo and the onscreen line “Official partner of the NCAA”.